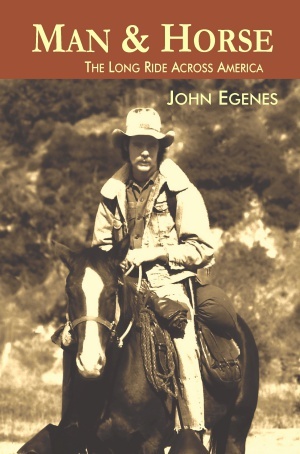 Featured Indie Book on Indie Author News: Biography / Memoir Man & Horse: The Long Ride Across America by John Egenes. Man & Horse: The Long Ride Across America: In 1974 John Egenes rode his young horse across the United States. The story of a young man coming to terms with himself, and how a little Quarter Horse named Gizmo showed the way. Ride with them as they make their incredible journey across an America that no longer exists. The Book has been self-published via Delta Vee Publishing and is available as eBook and Paperback - 290 pages - released in August 2017. In 1974 a disenfranchised young man from a broken home set out to do the impossible. With a hundred dollars in his pocket, a beat up cavalry saddle, and a faraway look in his eye, John Egenes saddled his horse Gizmo and started down the trail on an adventure across the North American continent. Their seven month journey took them across 11 states from California to Virginia, ocean to ocean.. As they left the pressing confinement of the city behind them, the pair experienced the isolation and loneliness of the southwestern deserts, the vastness of the prairie, and the great landscapes that make up America. Full of heart and humor, Egenes serves up a tale that's as big as the America he witnessed, an America that no longer exists. It was a journey that could only have been experienced step by step, mile by mile, from the view between a horse's ears. John Egenes has been a musician, a saddlemaker, a dog catcher, a university lecturer, and a hobo, among other things. His life is a highway that he views through a windshield full of squashed bugs. These days he makes his home in New Zealand.